Take some work we’re doing now that will help one of our clients provide year-round opportunities for children of all abilities to play, interact and be outdoors. 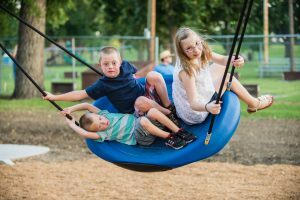 The Arc Lane County’s planned Arc Park will transform a plot of land in Springfield into an inclusive playground. This park will have state-of-the-art therapeutic playground equipment, as well as traditional equipment. Children of varying abilities can all enjoy activities there together. Plus, children can build empathy and understanding for others while doing what kids enjoy most – playing. The park will have a sensory area, instruments, a stage, restrooms, and a covered picnic area, in addition to the play structures. Right now the local Arc Park is in the planning, design and fundraising phases. There’s a Reveal Party on Oct. 16. I’m hosting a table. Let me know if you’d like to attend. Another project we worked on recently for the Oregon Community Foundation has the power to do good. OCF is, of course, known statewide for encouraging people to invest their assets in helping others, and for shepherding funds to worthwhile projects in arts, health, scientific research, education and improving conditions for people living in poverty. Recently, OCF guided funds to the new Boys & Girls Club of Corvallis’ capital campaign. This project is more than an all-new, two-story building – it’s a place where a growing number of children and teenagers will receive afterschool programming, educational support and mentoring, while now also benefitting from a healthcare clinic and mental health services on site. Specifically, the following funds of the Oregon Community Foundation contributed to the new Boys & Girls Club of Corvallis capital campaign: Brauti Family Fund, Fred W. Fields Fund, Youth Suicide Prevention Fund in Memory of Jason Daniel Sweeney, and an anonymous fund. Both these projects improve people’s lives. What could be better than that?